Activists fill Moscow center with posters of abducted Crimean Tatar (Video) In Moscow, the activists placed numerous posters with photos of the Crimean Tatar human rights activist Ervin Ibragimov, who was abducted in May. This way, the activists are trying to draw international attention to the abductions and murders of Crimean Tatars in the occupied Crimea, the press service of the Ministry of Information Policy of Ukraine told UNIAN. The ministry also posted a video on YouTube on abductions in the temporarily occupied peninsula. As UNIAN reported earlier, Ibragimov disappeared in Crimea in May 2016. His car was found abandoned in the middle of the road. Ibragimov is a former deputy of the Bakhchisaray city council, a member of the executive committee of the World Congress of the Crimean Tatars. Russia's federal Internet watchdog Roskomnadzor may block the website of Deti-404, a project which provides assistance to gay teenagers, if information that it considers forbidden is not deleted by the end of the day, said the website's administrator Elena Klimova on Tuesday, citing a letter from the agency. The letter said Klimova was sent on 10 October. The watchdog, said Klimova, did not elaborate upon precisely what information was deemed inappropriate. "Thus, the project will most likely be suspended in the near future on the territory of the Russian Federation. There will be no mirror website [made]. That is all the news. We are working on it," said Klimova. --The website, according to a court ruling, contains "information that explicitly promotes nontraditional sexual relations among children, namely homosexuality among boys, lesbianism among girls, and bisexual relationships among children." This, according to the court, was a violation of a law "on the protection of children from information harmful to their health and development." --In 2015, a court ruled to block the Deti-404 page on social network VKontakte. The management did, however, continue to work from a different address. Administrator Elena Klimova was fined 50,000 rubles (approximately $800) for the promotion of nontraditional sexual relations among minors. The Supreme Court upheld that decision. BEIRUT: Russian jets resumed heavy bombing of rebel-held eastern Aleppo on Tuesday after several days of relative calm, a rebel official and the Britain-based Syrian Observatory for Human Rights monitoring group said. Air strikes mostly hit the Bustan al-Qasr neighborhood, Zakaria Malhifji of the Aleppo-based Fastaqim rebel group told Reuters. Rebel officials and the Observatory reported casualties from the air strikes but gave no immediate toll. Moscow and Damascus reduced air raids in the northern city last week. The Syrian army said it was partly to allow civilians to leave opposition-held eastern neighborhoods. President Bashar Assad seeks the complete recapture of Aleppo, Syria's biggest city before the 5-1/2-year war, and which has been divided between government and opposition control for years. As of early October, 1 million 696 thousand Ukrainian citizens, who had been forced to move from Crimea and the occupied territories of Donetsk and Luhansk regions, were registered. This was reported by the press service of the Social Policy Ministry of Ukraine. "As of October 10, 2016, 1.696,326 internally displaced persons or 1.374,632 families from Donbas and Crimea were registered by the social protection departments of regional and Kyiv city state administrations," the press service informed. As reported, slightly over 1 million families applied for financial assistance, and 930,975 of them were assigned such benefits. Speaking at the VTB Capital Б─°Russia CallingБ─² forum, Russian President Vladimir Putin acknowledged that Western sanctions do hurt the Russian economy, but they also negatively affect the global economy. According to Putin, the detrimental effect of the sanctions, both in Russia and throughout the world, are especially apparent in the sphere of technology. "We often repeat the mantra that these so-called notorious sanctions do not really affect us. Their influence, and above all the threat I see, is the limit of the transfer of technology. This, incidentally, is not only detrimental to the Russian economy but to the world economy as a whole, because the Russian economy is a vital sector for the global economy," Putin told investors at the forum. Б─°So those who do this [impose sanctions] hurt themselves in the end,Б─² the Russian President added. Last edited by Hannia; 12th October 2016, 15:27. Leaders, like all other people, typically go through a process whenever confronted with a radical change in the situation around them. The first stage is denial, an effort to convince themselves and others that nothing has really changed and that the approaches they had used can still work. The second stage is a search for an analogy, for some event or events in the past which can provide guidance on what they should do. And only latter, and quite often after the crisis has crested, do leaders and individuals move on to an empirical approach, one in which they seek to find the specific features of the new environment in which they find themselves. In large measure, the challenges Vladimir Putin has posed to the world were initially met by denial, especially on the part of those Western leaders who felt that if they admitted there was a problem, they would have to come up with a solution – and not having an obvious solution, they tried as best they could to deny there was a problem. Now, they are in the time of the search for analogies, with some viewing what Putin has done as like Hitler’s actions in 1939 when he led a mobilized Germany to war against the rest of the world, with only Stalin as his temporary ally and others arguing the world is either going back to a new Cold War with its Cuban missile crisis or stumbling toward a hot one a la 1914. Obviously, the analogies leaders choose matter, because they will inevitably select from the flood of information those “facts” which confirm their point of view; and consequently, it is terribly important not only to consider the limits of the analogies on offer – Putin isn’t Hitler, Russia isn’t the USSR, and no archduke is traveling to Sarajevo – but to examine others as well. As in 1952-1953 with regard to Stalin’s plans, most of Putin’s entourage are “disappointed in Putin” and in his break with the West, which undermines their personal wealth and goals, he continues. There are exceptions, of course, like Nikolai Patrushev who has called for making use of nuclear weapons as a threat, something Putin has accepted. There is thus an objective basis for an elite move against Putin, “but there is no institutional mechanism or decisive group of people capable of taking a step so needed for the survival of Russia and possibly the entire world,” Piontkovsky says. The fundamental contradiction in Russia today is that “externally Russia is trying to be an empire but internally it ever more resembles a colony” — albeit one in which the colonial rulers come from the same nationality as most of the ruled, according to Dmitry Glukhovsky. The Russian commentator says that when other post-Soviet states celebrate their national days, it is clear to everyone that they are marking their “liberation from the former metropolitan center.” But when Russia does, what “liberation” is it celebrating? From the burden of empire? Or perhaps from its own past. Unlike all the others, he argues, Russians were enslaved by “people of the same nationality, the same faith and the same culture” as themselves, by Russians whose only desire was and is “to preserve power and use its idols” for their own benefit but not the benefit of the Russian people. Tragically, Glukhovsky says, Russians have generally accepted this arrangement without protest. “Why have we put up with this? … Why have we agreed to belong to cannibals?” How can Russians explain this? And why haven’t they either resisted or fled in massive numbers to escape such a fate? “Could it be that Russians simply don’t need freedom? That while other peoples do, [Russians] don’t?” After all, the last 25 years show that Russians were able “to free the colonies but somehow did not want and were not able to free themselves or even attempt to do so.” The most obvious answer is not encouraging. Even those Russians who protested government repression in the past quickly fell in line with the Kremlin following the annexation of Crimea, treating it as “an act of historical justice and a sign that Russia had finally risen from its knees,” Glukhovsky says. “Russia is condemned to be a police state regardless of what the authorities call it,” all in the name of holding its enormous territory. It appears that in the name of doing that, Russians have overwhelmingly concluded that they do not really need the freedoms that were on offer after 1991, Glukhovsky says. Instead, they are prepared to go back to being repressed as long as the borders stay where they are or expand. But there is a common element: freedom requires that people take responsibility, and neither group wants to do that. Some of this can be explained by simple fear and some by the fear of standing out, Glukhovsky says, commenting that whenever he publishes an article that “calls things by their proper names,” his parents and grandparents advise him to tone his comments down lest they call attention to and result in bad outcomes for him. Some younger people who do not want to struggle for freedom have simply left the country. “I understand,” Glukhovsky says, “those who march in columns, and I also understand those who put their heads in the sand.” They simply want to live their lives without problems. Only those like Anna Politkovskaya and Boris Nemtsov are prepared to show courage to make changes and to shame those of us who don’t follow their lead. A new meeting of the leaders of the countries in the “Normandy Four” could take place on 19 October. Kyiv has emphasized the necessity to create a draft roadmap to implement the Minsk agreements, which should determine the order of the implementation of security and political measures. In a memo for Ukrainian authorities, Ukrainian think tanks have prepared a memo regarding the “red lines,” i.e. the limits for compromise in the areas of political dialogue, security, and humanitarian issues that should not be crossed by Ukraine within the framework of the Minsk Agreements implementation. While the Minsk process is regarded as the only solution to regulate the conflict in Donbas, Russia has been exerting political pressure on Ukraine to conduct elections in Donbas before a ceasefire is established, and before Ukraine has full control of the border. Without proper monitoring by observers, this would open up possibilities for Russian-backed candidates to enter Ukrainian parliament and wreak havoc from within. The think tanks warn: the political part of the Minsk agreements must take place after the security issues have been resolved. • the ceasefire should be observed by the OSCE Monitoring Mission and the Joint Control and Coordination Centre, established within the Trilateral Contact Group. • permanent control over the border should be restored before the elections in the occupied territories. As an option, acceptable to the conflict parties, border control should be executed by the OSCE Special monitoring mission (SMM) or to the OSCE mission on the Russian border at “Gukovo” and “Donetsk” checkpoints, following the extension of the latter’s mandate to cover all of the Ukraine-Russia border. • security during the elections, including along the administrative boundary line, should be provided by an international police force, established with the OSCE participation and under its supervision and control. • the law on amnesty for persons connected with the events that occurred in certain districts of Donetsk and Luhansk oblasts should not contradict the Ukrainian legislation and should not apply to the crimes against humanity and war crimes. Furthermore, the law on amnesty should contain a defined term of validity and the conditions under which the persons that have been already pardoned can be held accountable for other crimes (e.g. in cases of crimes committed outside the time period to which the law on amnesty applies). This list is not intended to be exhaustive and may be expanded in accordance with the political situation. Ban on alcohol sales in Kyiv at night becomes effective Oct 12 Business entities, holders of relevant licences, are banned from selling alcohol as well as soft alcoholic beverages and beer from 23:00 to 10:00. The ban does not apply to restaurants, it is reported. The city council also recommends that the Kyiv police should tighten control over the enforcement of the Code of Administrative Offences, prevent the consumption of alcohol, alcoholic beverages and beer on streets, in parks and gardens, sports facilities and public transport. The Moscow media are filled with stories suggesting that Russia is preparing for war, but a close examination of the Russian government budget calls that conclusion into question, leaving open an even larger one: will this media firestorm lead to a real one or will it burn out of its own accord? “If someone thinks that we are preparing for a world war,” Schulmann says, “this isn’t visible” from the budget. “If we are preparing for something, then it is for some kind of internal disorders. We intend to feed our defense ministry a little less and to feed out special services and interior force structures more,” at least judging from the budget. But can what is going on in the media lead to something real, can the war on television become a war in reality? That is a question Moscow commentator Oleg Kashin addresses because he says if the current situation were a movie, the news would be a leading indicator. for the current Russian elite, “foreign policy always was only a continuation of domestic policy.” All of Putin’s words and actions are addressed in the first instance to the people of the Russian Federation and are intended to ensure that he and his entourage will remain in power. “What is to be done? They do not know.” They know how to ramp up anger but they aren’t prepared to live with taking the obvious next step. Sergey Shoygu likes playing military commander but only as long as it is play and not the real thing, Kashin argues, given what he has to know a real war would amount to. THE list reads like a hostage-taker’s demands. Russia wants America to roll back the expansion of NATO, repeal the Magnitsky Act, end sanctions and pay compensation for Russia’s losses. Until it does, Vladimir Putin declared this week, Russia will stop abiding by an agreement regulating the disposal of plutonium. Russia was forced to act, Mr Putin claimed, because of “the threat to strategic stability posed by America’s hostile actions” (and its failure to deliver on its end of the deal). The move is a reminder that, unlike America, Russia is happy to throw nuclear arguments into the mix when it does not get its way. The suspension of the Plutonium Management and Disposal Agreement (PMDA) is a message intended not so much for Barack Obama as for his successor. “Russia does not plan to work seriously with America” until a new administration arrives in 2017, says Andrey Kortunov, head of the Russian International Affairs Council. Mr Putin’s demands serve as a “wish list” should the next American president seek to restore the relationship. Tensions between Russia and America have been building over Syria, where ceasefire efforts have failed and Russian jets continue to pound rebels in Aleppo. On October 3rd, the day Mr Putin issued his decree, American officials announced they were pulling out of talks with Russia over Syria. “Russia failed to live up to its own commitments,” the State Department declared. Since the war in Ukraine, according to Samuel Charap of the International Institute for Strategic Studies, a think-tank based in London, Russia and America have managed to protect some islands of co-operation, such as over Iran’s nuclear programme. Now, he says, the tensions have “begun to sweep over those islands”. Russia’s willingness to invoke its nuclear might for political aims is alarming. A year after annexing Crimea in 2014, the Kremlin announced it could deploy nuclear weapons there. Even before suspending the PMDA, Russia had eroded the spirit of nuclear co-operation that prevailed after the end of the cold war. 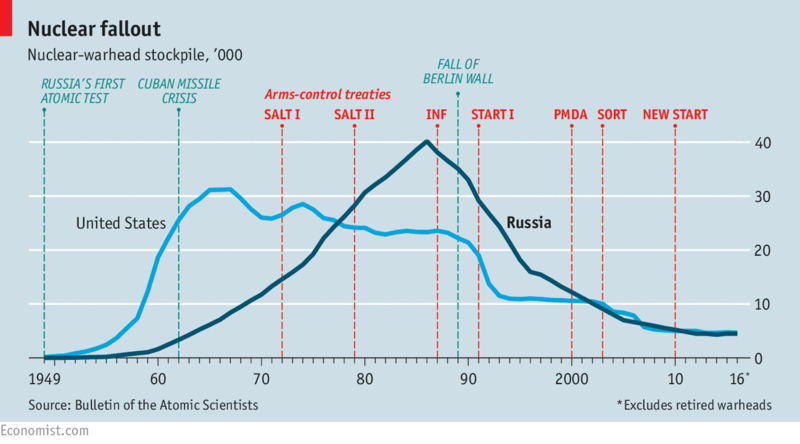 For the past three years, America has alleged that Russia is in breach of the 1987 Intermediate-range Nuclear Forces treaty (INF) because it has tested a ground-launched cruise missile with prohibited range. Russia has also refused to discuss limits on tactical nuclear weapons, the anticipated follow-up to the New START strategic weapons treaty of 2010. Mr Putin snubbed Mr Obama’s final Nuclear Security Summit earlier this year. Russia’s complaint that it has observed the PMDA more diligently than America does have some substance. Dogged by delays and rising costs in building a special facility to dispose of its plutonium, Mr Obama has opted for a cheaper method of treatment than the one specified in the agreement. Russia has declined to consent to this, putting America in technical breach of the deal. To keep the spirit of the agreement, America could press ahead with getting rid of its excess plutonium. Russia says it has no intention of using its stockpile for new warheads. Ridding the world of some of the stuff would make it marginally safer. The danger of suspending the PMDA is not so much in leaving more plutonium about, but in demonstrating that the Kremlin considers nuclear security just another bargaining chip. Russia is essentially demanding that Ukraine fully implement Minsk, including the holding of elections in Russian-occupied territory in the Donbas, while meeting a tiny part (at most one percent) of its Minsk obligations. After all, the most basic requirement of Minsk is an end to the shooting, but there has not been one day since the first ceasefire was agreed to over two years ago that there has not been shelling from the Russian-controlled side of the contact line. This is not a genuine offer to secure peace; it’s just a game. The Kremlin must be completely isolated until the shelling in the Donbas stops. It is high time for the West to understand that Ukraine is not a buffer zone. We are a strategic partner and the restoration of global security is not possible without Ukraine. Russia has cleverly used international institutions to prevent it from taking real steps to implement Minsk. It influences the decisions of the Organization for Security and Cooperation in Europe and its membership in the Parliamentary Assembly of the Council of Europe is laughable: Russia blatantly disrespects and disregards the organization’s mission. At the UN Security Council, Russia had no problem wielding its veto on the draft resolution on Syria, even when innocent lives are at stake. We have been given bad advice by some of our European friends. As Ukraine considered amendments to the constitution that would give eastern Ukraine greater decentralization so as to fulfill the Minsk agreements, one European official urged their adoption. “If someone slaps you on the cheek, turn the other cheek. This is a Christian value,” he told me. But this isn’t a theological discussion. The Europeans understand that Russia invaded Ukraine, but still they require the victims to take the initiative to resolve the conflict, which was triggered by Russian aggression. The situation that we are in—a hybrid peace—will bring more losses than the hybrid war that killed thousands in eastern Ukraine over the almost last three years. After 10,000 deaths, "turning the other cheek" means allowing more body bags and instability in the broader region. Putin will not give up his expansionism easily. It is time for the world to wake up. The West has pressured Ukraine during the last two years while not making any attempt to force Putin to secure a real ceasefire. Continental Europe talks a lot about values, but from Kyiv it looks like just that: a lot of talk. The dialogue between Europeans and the aggressor has nothing to do with Christian values. Negotiating with a tyrant using the language of appeasement is pointless. Russia annexed Ukrainian Crimea and then invaded the Donbas, bombed peaceful districts of Aleppo, has built up its military massively, engages in military provocations in the Baltics, and ignores its agreements on peacekeeping and military deterrence. How many times should we turn the other cheek? We were hopeful that the West’s response might change this fall. Even after the interim report of the Joint Investigation Team on the MH17 tragedy demonstrated that Russia provided the Buk missile that killed 298 innocent people, and even after Russia and Syria’s inhumane attacks on hospitals and civilians in Aleppo, the West’s response was inadequate. France, Germany, and the United States could take actions that would get the Kremlin’s attention. They could suspend Russia from the SWIFT banking system or refuse to buy its oil and energy products. A recent picture at the United Nations was equally depressing: nothing could be done as Russian blocked the French resolution calling for a ceasefire in Syria and the banning of military flights over Aleppo. The weak and conciliatory reactions of the West deeply concern us, and they concern others in Eastern Europe as well. The sad truth is that the West does not seem to know how to confidently stand up to Putin any more. It's official: Guterres appointed next UN Secretary-General The UN General Assembly today appointed by acclamation the former Foreign Minister of Portugal, Antonio Guterres, as the next United Nations Secretary-General, to succeed Ban Ki-moon when he steps down on December 31, the UN press service reported. Mr. Guterres, aged 67, was Prime Minister of Portugal from 1995 to 2002, and the UN High Commissioner for Refugees from June 2005 to December 2015. He will become the world's top diplomat on 1 January 2017, and hold that post for the next five years, reads the report. Adopting a consensus resolution put forward by its President, Peter Thomson, the Assembly acted on the recommendation on the UN Security Council, which on 6 October forwarded Mr. Guterres' name to the 193-member body as its nominee for UN Secretary-General for a five-year period, ending 31 December 2021. The Assembly's resolution also welcomed the historic process Member States set in motion late last year: the selection of a new United Nations Secretary-General, traditionally decided behind closed-doors by a few powerful countries, has for the first time in history, involved public discussions with each candidate campaigning for the world's top diplomatic post.